If it is hard to understand the concept of “energy,” think of a machine powered by the electricity running through it. People and animals are like a complicated machine with energy being the “electricity” that makes the body work. 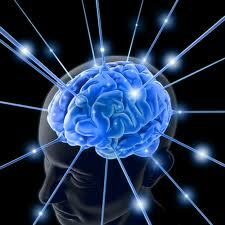 Everything made of “matter” has an energy associated with it and emits or gives off its own EMF. Some energies are good for us, they sync with our energy and make us stronger, while energies that are bad for us clash, creating weakness and dis-ease. In the past two decades, the electronic revolution exploded creating massive amounts of EMF (electro magnetic field energy) that interfere with our bodies EMF and causes a disruption in energetic communication. Low Frequency EMF or 60 hertz, is what most homes run on. Appliances, wires in the walls, power wires outside, and all electronics plugged in (even if they are not turned on) bombard us with EMF. There are specific meters for the 4 different EMF types (electric, magnetic, high frequency and dirty electricity). Knowing what is affecting you is critical to enacting resolutions. Acoustimeter: Detects high freq like cell phones and Wifi. dirty electricity from home wiring. Cellular, radio, and wireless frequencies emit high frequency EMFs. Holding cell phones to your head or putting blue tooth in your ear sends EMF emissions into your brain, negatively affecting the bodies energy, creating stress, leading to cell damage (free radicals) and dis-ease. People who work in high EMF areas often complain of being exhausted at the end of a work day. Some people complain of headaches and foggy thinking. water in their brains and thinner skulls than adults, are more severely affected by electronic EMF. And which generation uses the most electronics? Kids! Everywhere we go we are surrounded by EMF. We are exposed to EMF in stores (especially electronic stores! ), business’s, doctors offices, banks, hospitals, government buildings, computer plugs that have adapters, wireless networks, and people near us that carry cell phones in their pockets or purses. There are palliative measures that can lower EMF in your home, but these measures only lower exposure, they do not block all the sources of EMF from negatively influencing your energy fields. Examples include EMF tents, but they only work when you are in them, and it is not practical to live under a tent. Tube headsets and ferrite filter (or ferrite beads) help disperse highest amount of EMF through the headset wire. Some of the grounding bed pads or foot pads could actually make you part of the circuit, not protect you from it. running during the times you are in that area. B. Create distance between you (your pets) and the source. EMF. Use a hose extension to create distance. Use corded phones. fabrics. Appliances/ equipment can be shielded as well. D. Develop a strong immune system! Eat right, sleep well, exercise! An effective and inexpensive (nice combination for a change) protection from electronic EMF are EMF Holographic Chips. They work non-invasively by stimulating the body’s electromagnetic field, quickly helping the body naturally restore its energy’s communication. They also block ambient EMF from interfering with the body. The EMF chips cost under $5 and last for several months. They are most effective when placed between the electronic device and you. For cell phones it is recommended to place one on the front and one on the back (the front of the phone is in contact with your face and the back with your hand). 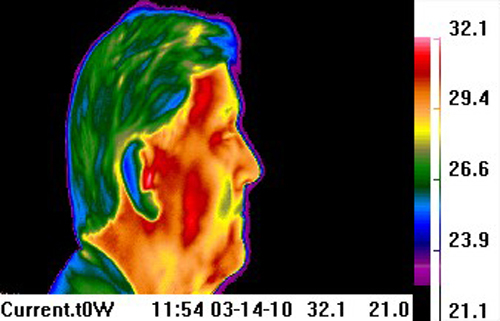 For those who still need convincing that the EMF emissions off cell phones significantly impact us, the following thermographic test was performed to establish the effects of cell phones on the human body, particularly the head and brain. 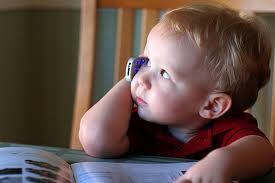 The first test below, shows a subject in natural state before holding the cell phone to his ear. The red denotes heat and the blue coolness. The second picture is of the same subject while applying the cell phone to the head (ear) simulating talking or answering a call. Please note that the effects of cell phone radiation were tested during actual calls and without a call on line. It was found that the effects on the head as registered by the thermal imager was the same whether the phone was in a call or hung up mode. 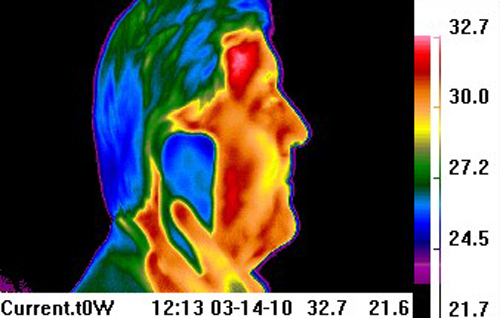 Note the greater increase in head and neck heat with the cell phone application to the ear (denoted by the increase in red and darker colors after the application of the phone). The final image was taken after a EMF chip was applied to both sides of the cellphone and then placed at the same location by the ear as above. 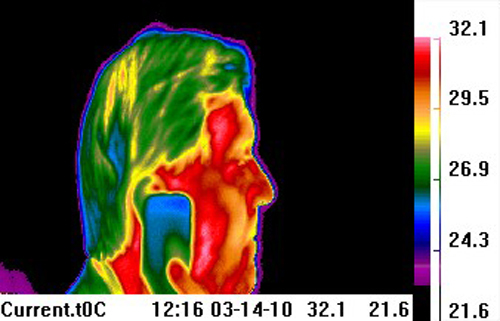 Note the marked reduction in head heat (denoted by the increased blue) with the usage of an EMF chip on the cell phone. The fact that the subject is even cooler (note the increased amount of blue) than the first image implies that the EMF chip on the cell phone is also blocking ambient EMF coming off of other electronics in the room. Most people agree that cell phones, computers, and other electronics emit EMF that can be harmful. That being said, we are in an electronic world and becoming more dependent on electronics daily. 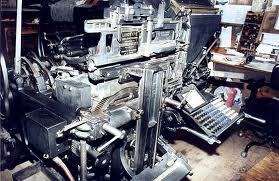 Electronic devices are considered a necessity; they are not going away. It is therefore imperative that we take measures to protect ourselves and especially our children from the potential dangers of electronic EMF. Thank you, glad you like it and hope it makes you safer! Does this mean this is in Wikipedia? happening to them too? This could be a issue with my web browser because I’ve had this happen previously. Checked and it seems to be your browser, sorry!